Coming straight out of Woodford Folk Festival with Rhythm Hunters I am taking the good energy from the festival and plowing right into some exciting new projects this year! I am super excited about this Saturday 5th in Brisbane, when I will be playing with the wonderful guitarist Camaron De La Vega at The Baby Grand in West end. We will be collaborating on his original flamenco inspired tunes, some gorgeous jazz standards and looking forward to having some special guests get up as well. 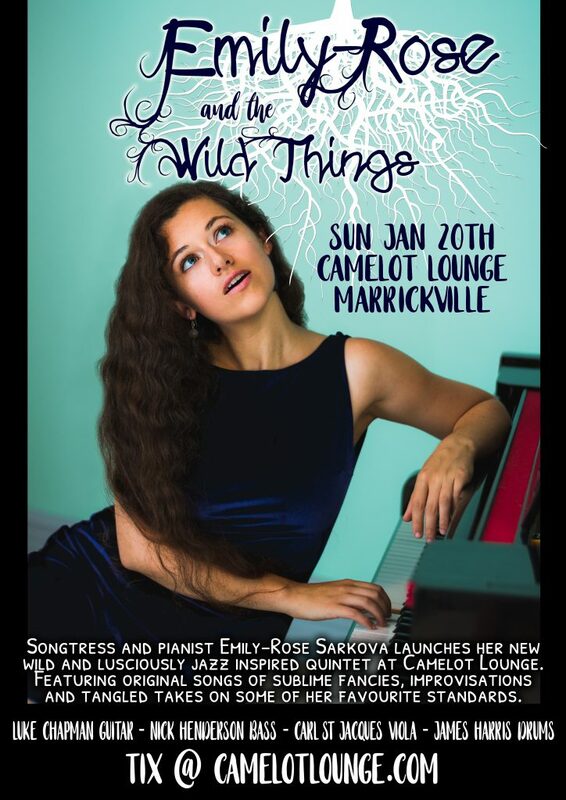 On 20th of January I am presenting my very new and shiny jazz quintet at Camelot Lounge in Marrickville, Sydney. It’s called Emily-Rose and the Wild Things and features myself on keys and vocals, Luke Chapman on guitar, Nick Henderson on bass, Carl St. Jacques on Viola and James Harris on drums. It is going to be a ride through original songs by myself and Luke, and some twisted takes on some of my fav standards. This group is something I am extremely excited to begin and hope to see some friends and fans come out for an excellent night! Previous PostPrev Article Chaika’s third album on its way!